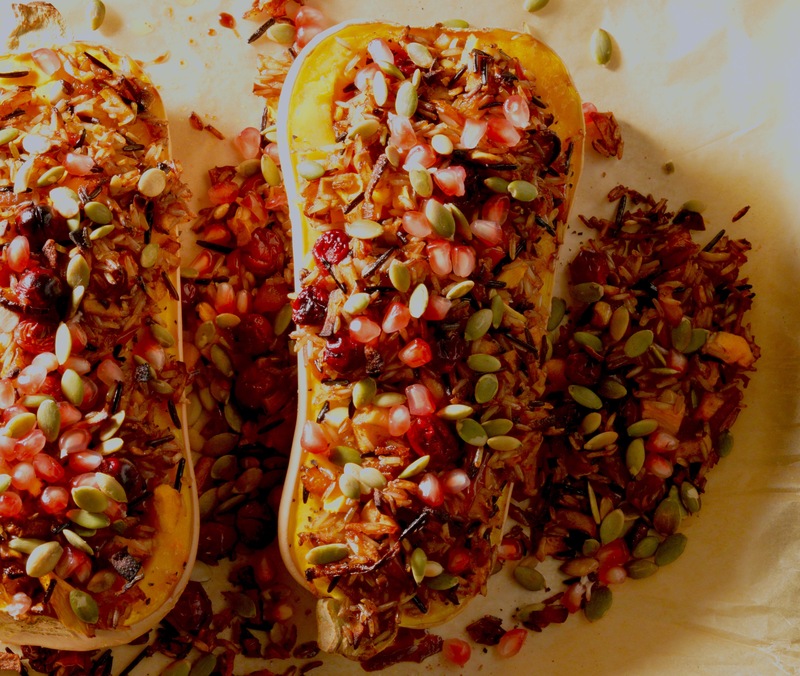 This Thanksgiving, impress your guests with this amazing roasted squash. My girlfriends were coming over and I decided to test the theory of this idea on them. 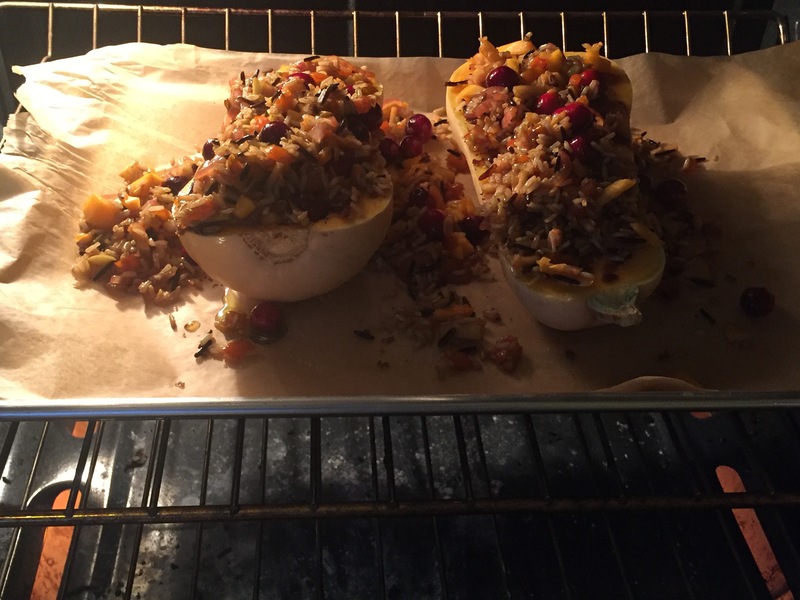 I know I’m not the first person to stuff and roast a squash, but I had never seen a recipe with the combo of ingredients and flavors that were floating around in my brain. This squash is the first in a series of side dishes that I am going to be sharing with you all for Thanksgiving. I will be featuring sides with a more health conscious feel on Monday’s. However, in the true fashion of my Fat Tuesday posts, I will be spooning on the butter, mayonnaise and full fat gravy. Back to Mindful Monday. I wanted to play off of the natural sweetness of the squash, but I didn’t want a sweet dish. The tartness of fresh cranberries, the sweet tang of balsamic vinegar, the earthy flavor of sage… These were the flavors that I had imagined. 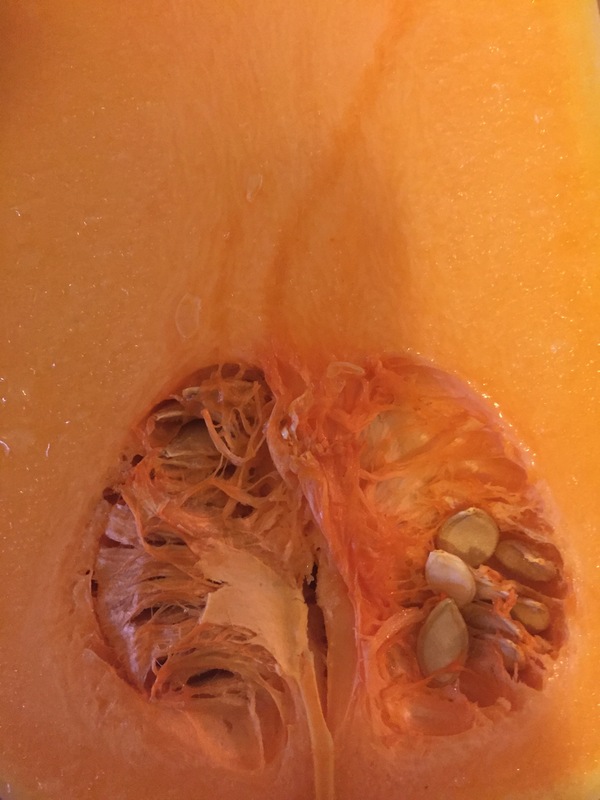 1 butternut squash, halved, seeds and pulp removed. 1 bell pepper, chopped. I used orange but any color will do. Remove some of the meat of the squash with a spoon to give yourself more room for stuffing. Chop the removed squash and set aside. S&P the squash and sprinkle about a quarter of the brown sugar over both halves. Melt butter in a saute pan. 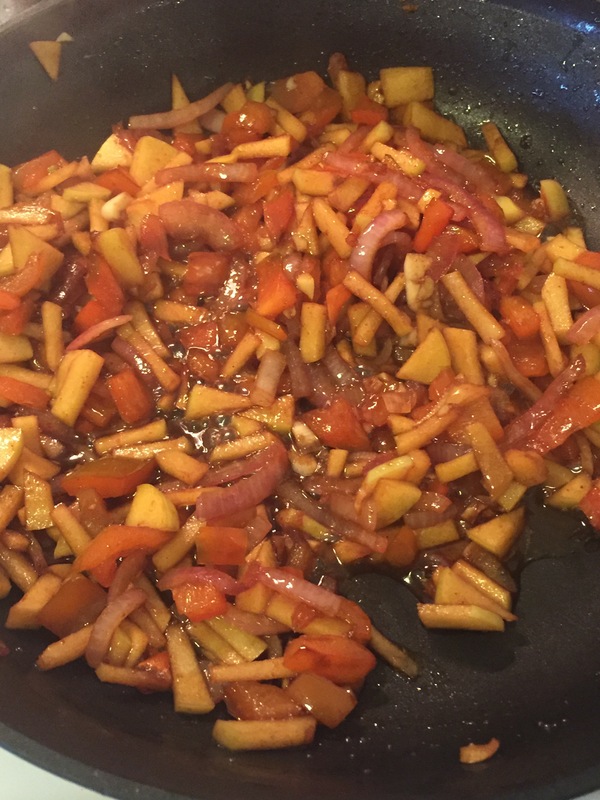 Add apples, onion and bell pepper and saute for a few minutes. Next add sage, balsamic vinegar and remaining brown sugar. Saute until tender. In a mixing bowl, combine rice, cranberries and sauteed mixture. Place both halves of the squash onto a parchment lined baking sheet and spoon the stuffing into each half. If you can’t fit all of the stuffing into the squash let it spill over onto the parchment and it will make a lovely crunchy addition to this dish. Cover loosely with foil and bake in a 425 degree oven for 40 minutes. Remove foil and continue baking for another 20 minutes or until squash is fork tender. Sprinkle pomegranate arils and pepitas over the top. Serve warm. Scrape out the seeds and pulp with a spoon. This was a desirable squash. The neck was long and the bulb was smallish. That told me that there was a lot of squash “meat” to be had and fewer seeds. Use a spoon to carve out some more space to receive your stuffing! Saute it all together for the filling. The balsamic and brown sugar, combined with the flavors of sage, onion and bell pepper will give off an aroma that will make it even more difficult for your guests to be patient with you! So, watch your time! Once you remove the foil, your oven will start creating crispy edges to this marvelous vegetable roast! Look at it go! The end result was a decadent, meat free side dish that will leave your guests feeling especially satisfied. I hope you will try this out! Maybe it will even become a holiday staple! Swearing Mom out. Wow looking good and healthy! Thanks for the good idea! 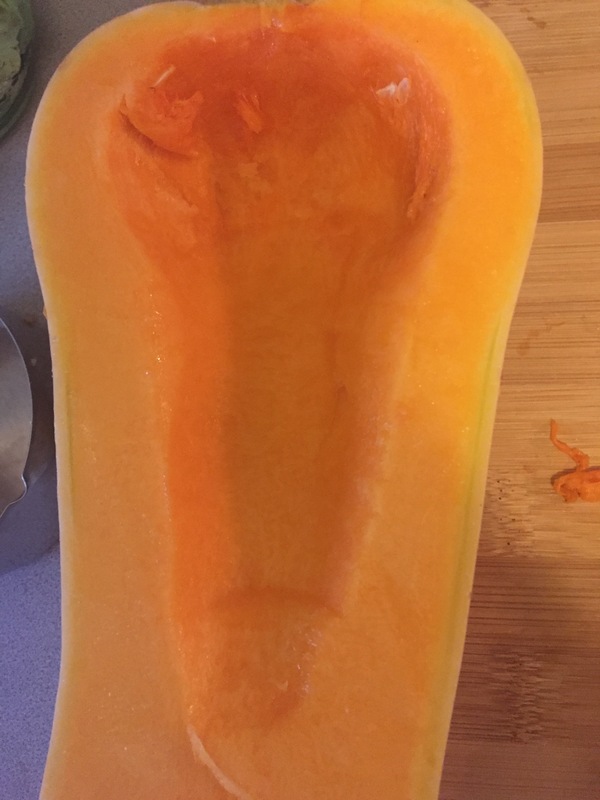 Just bought some squash yesterday. Definitely going to have to try this! Awesome! I would love to see results!